Islamic finance is drawing more interest in Russia as the country struggles economically and requires fundamentally new approaches to attract investments from abroad. The sector is just beginning to grow in Russia and its perspectives were discussed during the recent Gaidar’s Forum in Moscow, one of the major annual international conferences on economy in Russia. Implementation of Islamic finance in Russia started through the so-called pilot projects in the predominantly Muslim republic of Tatarstan. It has both existing infrastructure and client base. It also has lots to offer to the potential partners from the Arabian Gulf countries. Russia has a native Muslim populations of roughly 20 million. As an example, the UK might be a role model for Russia in Islamic finance as it has issued Islamic bonds. Islamic banking could account for up to 5 per cent of the entire financial market in Russia and it could follow the path of neighbouring Kazakhstan that is expecting Islamic finance to constitute 10 per cent of its financial market by 2020. Russia initially planned to introduce Islamic banking during the crisis of 2008, as it started looking for additional resources. However, because of unfamiliarity with Islamic banking rules the Russian bank VTB did not succeed in issuing a planned sukuk in 2009. The current crisis dictates new realities for Russia that excludes possibilities of a swift recovery similar to the post-2008 period and the Russian approach is more structural this time. Tatarstan has nurtured close relations with the Gulf region for years. Delegations from many Gulf countries regularly participate in the international forum of Islamic business and finances ‘Kazan Summit’ in the capital of Tatarstan, Kazan. 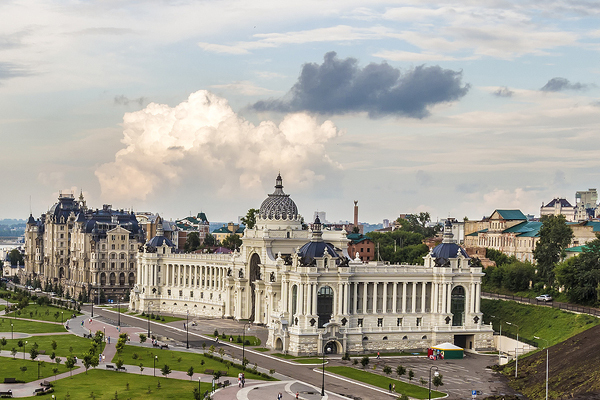 Several countries have already bankrolled $760 million into ‘Kazan Smart City’, the Tatarstan’s ambitious business hub, as a part of Tatarstan Gulf Investment Company. In fact, the first Islamic bank in Russia is Ak Bars Bank from Tatarstan. It has already attracted a number of investments from the Gulf, including $60 million in 2011 and $100 million in 2013. The republic has took its first steps into the world of Islamic finance by issuing a sukuk in 2015 for financing a major business centre in the capital of Kazan. The pioneering status was highlighted by an agreement in April 2015 between a Malaysian-Russia consortium and the Tatarstan government during the Kazan Sukuk Conference. The agreement serves as a roadmap for opening of an Islamic bank or Islamic banking windows in the republic. The establishment of Kazan as a centre of Islamic finance in Russia will help expand the sector to other Muslim and non-Muslim regions of the country. If the Tatarstan’s plan succeeds more regions will follow. Dagestan is the second region in Russia that is undertaking serious efforts to implement Islamic banking and attract investors. It is lagging behind Tatarstan and does not have a clear roadmap yet. However, the local government is already working on implementing similar framework and will largely follow the Tatarstan’s path. The major problem facing Islamic finance in Russia currently is related to the legal structure. There is neither an existing law nor a draft law regulating the sector in the country. There are also no legal framework that allow state regulators to support banks that have zero-interest operations. Thus, any investment in the field will be of a long-term nature as it will take time to bring in new legislation. Russian public as well as authorities are also largely sceptical about Islamic finance. Based on the National Agency for Financial Studies (NAFS) survey only 12 percent of Russian Muslims are ready to use the Islamic banking services. Such results are largely due to the low level of knowledge about the Islamic banking. In many ways Islamic finance could be implemented in Russia with the bottom-up approach. Local banks could open so-called ‘Islamic banking windrows’ within their branches and see how it works in comparison to standard banking procedures. This approach would gradually reflect advantages of Islamic finance and raise its appeal among the general public. It might become a feasible alternative to the traditional banking and appeal to both Muslim and non-Muslim Russians with its underlying principle to invest in tangible products. Furthermore, tolerance to customers who have missed payments under Sharia law will attract popularity in a country with infamous brutal practices of collection agencies.